A temporary restraining order was partially granted against Starr County’s electioneering regulations. U.S. District Judge Randy Crane issued a ruling Wednesday which granted part of the TRO application filed by the Mexican American Legal Defense and Educational Fund, or MALDEF, and Texas Civil Rights Project. The decision allows the county to continue banning electioneering in parking areas under the county’s building and property use policy, adopted Feb. 12, but temporarily blocks the section of the policy which requires a permit to use other county property. Their application and lawsuit, filed on behalf of a Starr County candidate and the Starr County Republican chair, argued that the policy violated First Amendment rights. The lawsuit initially focused on an electioneering ban adopted in January, which prohibited electioneering on all county property. However, during a hearing in federal court Monday, the ban was deemed unenforceable and focus quickly shifted to the property use policy. That policy essentially overrode the ban by allowing the use of county property, not designated parking zones, with a county-issued permit. While prohibiting electioneering in parking lots was deemed reasonable in the judge’s decision Wednesday, due to the fact that their primary purpose is to provide parking, regulation of other common spaces such as sidewalks raised concerns that “use” of those areas included passive political speech such as wearing a political T-shirt. The county’s arguments for regulating parking areas, the opinion stated, “do not justify prohibitions of electioneering in common areas — to include, apparently, the prohibition of passive speech in public fora — past the 100-foot buffer zone.” That buffer zone is mandated by the Texas Election Code which prohibits electioneering within 100 feet of the door to a polling location. Representatives for MALDEF and TCRP issued a news release Wednesday hailing the decision as a victory for free speech rights. 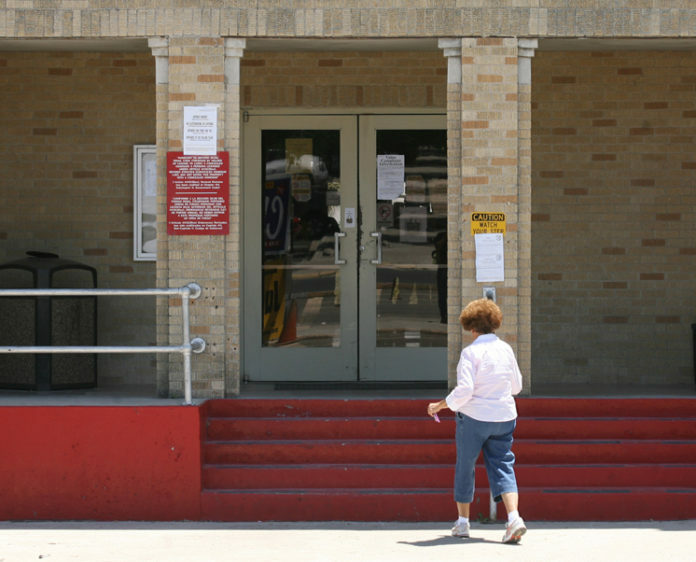 Efrén Olivares, racial and economic justice director with the Texas Civil Rights Project, said the decision restored equal opportunity to participate in the electoral process. However, 229th District Attorney Omar Escobar, who had a role in crafting the policy and who testified on the county’s behalf during Monday’s hearing, said he didn’t believe the plaintiffs, MALDEF and TCRP, accomplished very much. The majority of the policy remains in effect, Escobar pointed out, but said the county would be revisiting the section that was blocked by the restraining order.